-- Please Choose an Option --1/4" 1/2" 3/4"
This holster is called the BOSS for a reason. Here at the Pro Shop, we get pissed off if our stuff isn't quite right. Every other holster on the market has some problem that we found annoying. So we made our own. BOOM. This set includes the BOSS DOH holster hanger. This hanger is stable yet adjustable. It holds the gun in USPSA legal position and can be mounted higher in order to be Single Stack legal. This holster also comes with thumb screws as standard. You can use the Comp-Tac PLM, Blade-Tech Tek-Lok, Safriland ELS, or the standard BOSS belt mount. The Huron holster was designed with the goal of creating the best Competition holster with direct input from professional shooters. After tremendous trial, design, and review we released this model to give its user every advantage. Each holster is verified to the measured parameters set by USPSA/IPSC/IDPA/3-Gun division rules. Whether just a beginner or training to take a National or International Championship, you can count on your holster to perform flawlessly. This model uses .093" for solid colors and .080" for some prints and camouflage patterns. The Huron holster can also be configured for Tactical users who desire extreme reliability but do not require Level II retention. Selecting SRA Cut provides a more secure fit for range, training, or 3-Gun matches where dynamic movement and position are more common than not. The best option for Competition and Tactical users looking for professional grade equipment. This holster is fully customizable for your lifestyle and needs. It is backed by our Limited Lifetime Warranty. Great holster for my X5! A much better fitting holster for my X5 than my CompTac holster. I also like the minimalist design and it works perfect with the Boss hanger. The only thing I could say is that it’s not as thick as other kydex holsters however, once it’s bolted to the Boss hanger it feels solid. 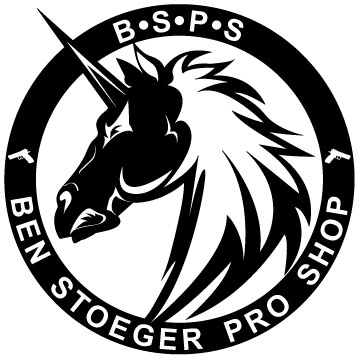 Fast drawing and easy reholstering, plus the BSPS logo looks cool! And as always fast shipping, best online store on the web! I ordered this holster for my Walther PPQ Q5 Match and received it a few days later. The product shipped and was received fast, quicker than i expected. I have a few other holsters from other manufactures around similar price points however, the quality of this holster and the material selection used to manufacture this product are by far, superior. I received the exact configuration what i order which, may sound like a no brainer but, i've had mis-ships in the past so, this is a point worth mentioning. The aluminum plate fits well with my belt and the back plate infinite adjustment options allows for any position you need for quick, clean draws. Well made product and i will be recommending holster to my fellow competitors.